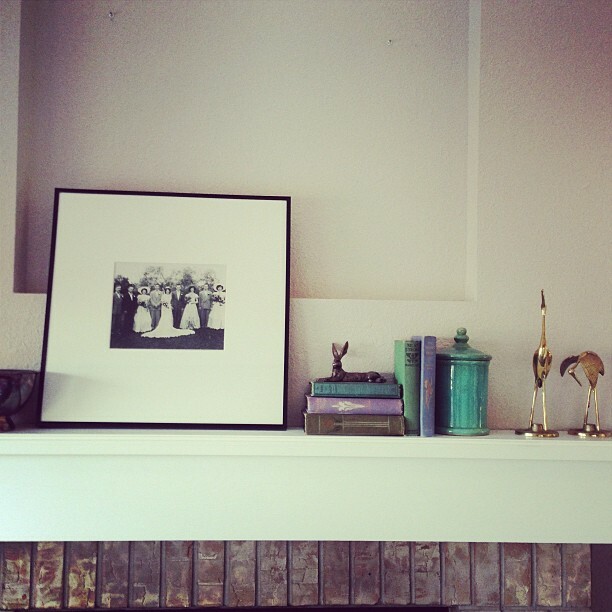 Here are my new birds in their perch upon the mantel. The picture is from my grandparents’ wedding. I think it’s so beautiful. I’m finally starting to like how this little display looks—I think it looks like me. The color of the brick around the fireplace is a little odd; I’ve wondered about painting it white (which some people say you should absolutely not do because of moisture, or something). I do kind of like the contrast of materials, though—especially in a house as new as this one, going too monochromatic seems like a bad choice. And it’s already rather grayish whitish in here. Though I wish that our almond bathrooms could be more on the whitish side of things. I’m trying to reconcile myself to warmer tones, but I did spend my formative years in my mother’s entirely white house—white carpet, white walls, white slipcovers. As I’ve said before, progress—and reform—is slow.